***How about your action and speed ? We add the Game Center ,so you can challenge all your friends ,even the world! Yes, To be the best one ,you can!!! 2.make sure the cars pass the cross road safely! 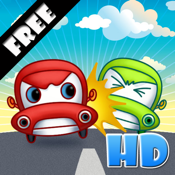 3.pass more cars, get higher scores ! ------Classic: get specified scores before time becomes 0. -"I like this game it's so addicting plz add more levels PLEASE"
-"Really good game, simple concept but nice and challenging!" -"i like this game. but it takes patiences"
-"I loved this game. Within a day (give or take) I had finished it and replayed twice. I am reccomending this to you, so download it, now!" Traffic control is the world's most interesting job.Now this game is just about traffic control.It's an incredible simple game.All kinds of cars are controlled by tapping the traffic lights.When a speccified number of cars passed the intersections, you'll be advanced to next level. -Incredibly easy to learn.Just tap the lights to control. -It's so addictive.You may play it all day. -15 levels.There is 15 levels for you to challenge.It's crazy! -Many cute cars such as trunks, ambulances, police car and so on. -Three different difficulty to choose.Easy,normal and Hard. Welcome to play Crazy Car.